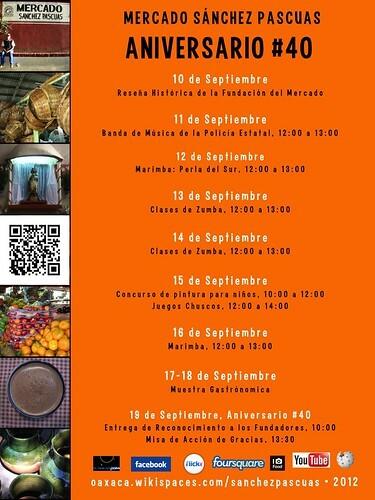 Oaxaca de Juárez, México – This week is the 40th anniversary celebration of the Sánchez Pascuas Market. Check out today’s music video from the state’s police band. 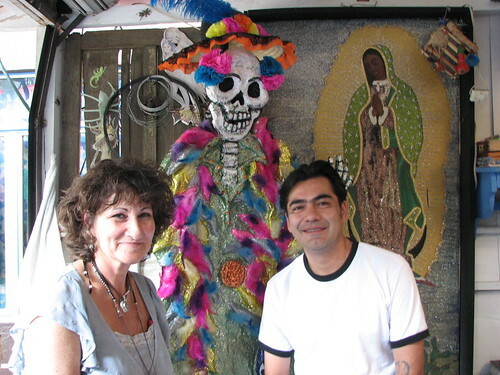 Of course I am biased, but Oaxaca is a great place to celebrate the Fiestas Patrias! David Sterling, chef and mastermind behind Los Dos Cooking School in Merida, has the right idea about cooking in Mexico. Use what’s fresh, use what’s local, and try regional recipes. That’s exactly what he teaches in his cooking classes, dished up twice weekly between the months of October and March. Add a pinch of Yucatec history, a smidgen of Maya culture, a sampling of fresh spices and you have a tasty recipe indeed. For Sterling, a Merida resident of many years now, cooking came naturally and one thing led to another down the path of regional cooking. Originally from Oklahoma and “weaned on chili,” Sterling discovered Mexican food early on due to a large Mexican population where he grew up. In an interview the chef said his career took parallel tracks–cooking and design. While in graduate school for a Masters of Fine Arts in Design at Cranbook Academy of Art in Michigan, he worked part time as a pantry chef at a well-known French restaurant, Le Bijou. This inspired him to start a small catering business. After graduation he moved to New York City where he lived for 25 years. A friend who lived in the Yucatan urged him to come to Merida to visit, and after seven trips, he was hooked on Mexico. He did some serious thinking and decided on turning 50, “Why not shake it up?” He took the plunge, wrapped things up in NYC and moved to Merida. On arrival he bought an old mansion with 18 foot ceilings, lots of space but in need of repairs. The plus side: it was in the historic district not far from the main plaza. He and his partner, Keith Heitke, started renovation. When first in Merida, Sterling designed a gourmet line of Mexico food products that can be found on his website (www.los-dos.com) and slowly the idea for a Yucatan cooking school took shape. Now Los Dos hosts hundreds of students a year, mostly in the seasonal winter months. Designed for people who love to cook, each class begins with coffee and pastries while Sterling gives an impromptu presentation of the history and techniques of Yucatan regional cooking. Sterling elaborates on the finer points of local food lore and the importance the Maya played in the development of Mexican cuisine and culture. 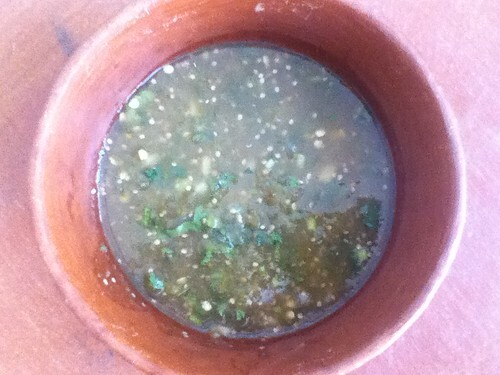 The chef’s knowledge of Yucatec cooking comes from an intense interest in the subject. He scoured old cookbooks and did research through standard texts on the Yucatan, including books as seemingly unrelated to cooking as Friar Diego DeLanda’s Yucatan Before and After the Conquest. But even basic history books, he explains, have messages on what the food of the day was like. He calls his wealth of knowledge on Yucatan food serendipitous, crediting a long list of mentors, including his friend Marta, a local anthropologist, and his favorite food writer, Sophie Coe (The True History of Chocolate and America’s First Cuisines), wife of archeologist and Maya scholar Michael Coe. Two friends, Diana Silveira and Socorro Rodriguez, also played a role as they’ve cooked with him since he came to Merida and taught him their skills in preparing regional cuisine which to them was just home cooking. Included in the day’s itinerary is a tour of the sprawling Merida market, and under Sterling’s tutelage, students learn to identify first hand the exotic ingredients that make up Yucatec flavors by shopping for them. Then back to Los Dos to start cooking. What do the students whip up? 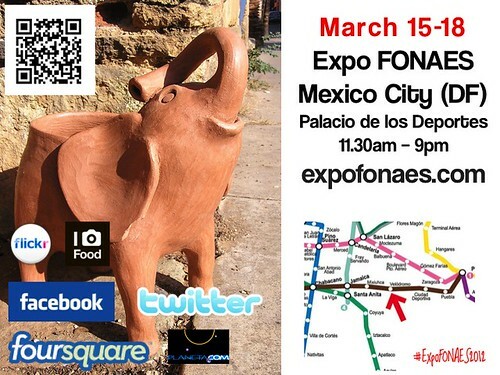 Everything from tortillas to salbutes, panuches, tamales and more. The school caters to a variety of needs and Sterling is flexible in how the classes are run. The grand finale to this epicurean adventure ends with a dinner the students prepare under Sterling’s guidance. It’s served in his formal dining room complete with all the trimmings. A meal fit for a king? Well, maybe not far from it. 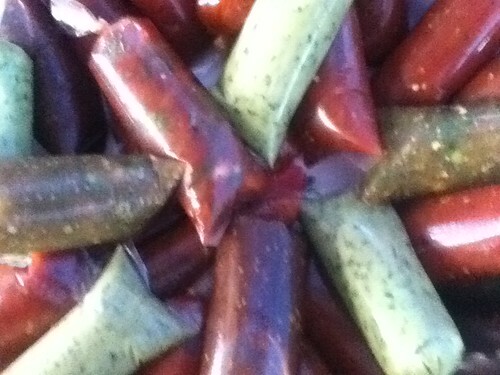 For rates and info, check out: www.los-dos.com. I am editing (and savoring) the guide to Menu Spanish. 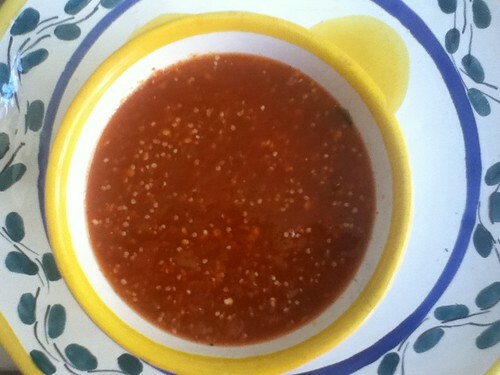 Here’s to salsas, a critical element in what you can eat in Oaxaca. 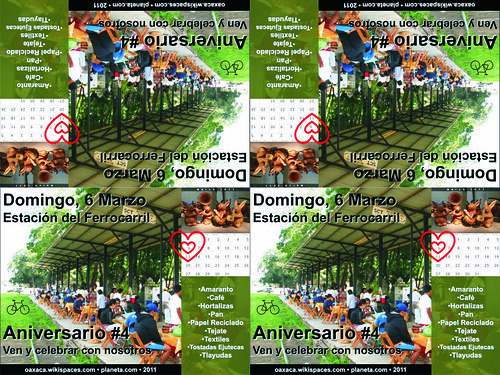 Oaxaca de Juarez, Mexico – Today the train station market celebrates its 4th anniversary! Septehambre, originally uploaded by planeta. 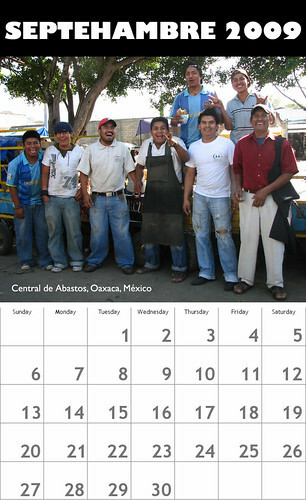 This calendar shows the guys that run the ‘carretas’ (carts) at the Central de Abastos in Oaxaca.